What should you expect from a Nick Cave film? This was the thought I had as I drove to Nottingham’s Showcase Cinema on Thursday 8th September to review Nick Cave & The Bad Seeds One More Time With Feeling. 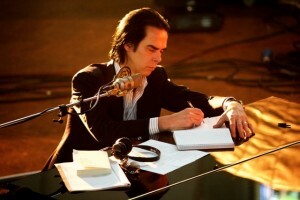 I’ve liked Nick Cave’s music for a while. However you’re introduced to him it doesn’t matter – as long as you are. Personally, I first discovered him when he battered our beloved pop princess Kylie’s Minogue with a rock in the video for ‘Wild Rose’, what’s he done to Kylie? I was shocked. This was during her indie era, and credit to her for working with Cave, apparently he’d wanted to work with her for a while, waiting until he found the right song. She was hooked as soon as she heard it. So was I.
Cave has always been dark and deep, so to the outsider it might seem that a feature length, one night only documentry is a little self- indulgent to launch his sixteenth studio album, not the case. Cave’s world was thrust into turmoil in July 2015 when his 15 year old son Arthur fell to his death from a cliff in Brighton. The film is a candid view of how this has affected both his life and his work. The film itself about loss, life, devastation and recovery. So why do it? Is grief not a private matter? Yes, it should be, but the media circus would not leave Cave to grieve privately. The idea of a sit down interview to put the record straight didn’t work of him, it was unfeasable and so the idea of ‘One More Time With Feeling’ came about. A documentary which glimpses into the process and Caves mind. Shown in 150 cinemas across the UK, originally a performance based concept, One More Time With Feeling evolved into something much more significant as Director Andrew Dominik (Chopper, The Assasination of Jesse James) delved into the tragic backdrop of the writing and recording of the album. Interwoven throughout the Bad Seeds filmed performance of the new album are interviews and footage of Caves intermittent narration and improvied rumination. We see snippets of Cave in the back of a car, playing, writing The Skeleton Tree. Early on in the documentry he says he fears he’s losing his voice, in the same way he loses other things, his phone for example. At this stage his son is not mentioned, recording of the album began before his death, but we the audience already know the connotations. Filmed in black and white, it’s not for the sake of art, it only highlights further the stark fragile and raw emotions. It is also in 2D & 3D. Again it didn’t need to be, the message would still have been there, yes we get a few great 3D effects such as the bow of a violin coming towards you, a hand, the enormity of an empty staircase, but peel back another layer you realise the effect further brings the film to life, after all, is that not what the film is about? Life He also refers to women as being 3D whereas men he says are 2D. Cave dwells on the enormity of the universe and the comparative insignificant of the human self and our blink of time on earth. As an artist he feels his record at least has a place in history, a legacy he leaves behind and yet compare that to the size of the universe and it’s age, it’s nothing. The only thing we have as humans that the universe does not is consciousness and being, right here, right now. It is with this view that he tells us he and his family have decided to be happy. Being happy he says is the best revenge against loss. There are intimate, poingnant moments with his wife Susie and other son Earl, Arthur’s twin, who is given a camera to take snap shots, another nudge at the quickness of life and the moment. We see Cave at home. This provides some humour. His observation on changes in the home and the fact his wife can completely change the use of a room whilst he’s asleep. “Go to sleep in the bedroom, wake up and it’s been turned into a tv room around me” with home also comes memories however, photos, art. One framed painting in particular done by Arthur at the age of five ironically of the very spot he died. As a track sung by Arthur and Earl as children plays, The documentary ends with each person within the film alone in front of the camera, producer, musician, wife, son, Cave until finally an empty space. That left by his son. Driving home, I had a lot more to think about.